Good Jobs LA with the help of hundreds of community members, students, and labor groups like SEIU Local 721 led a rally across Downtown LA which culminated in a bridge action. 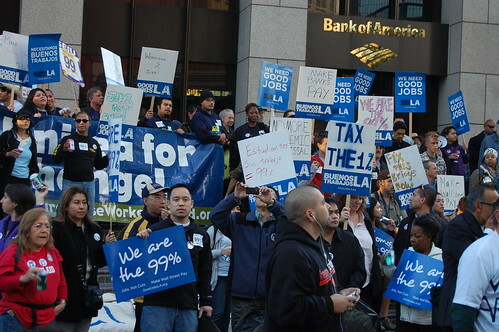 The November 17th action started at the Bank of America Plaza and end up near a downtown bridge next to the Westin Bonaventure hotel. Twenty three people were arrested included staff from SEIU, SEIU Local 721, and USWW. The following are media clips of the day’s events via Storify. This entry was posted in Events, Fair Economy, OccupyLA and tagged Bank of America, Bridge action, Good Jobs LA, Los Angeles, N17, OccupyLA, OWS, Protest, rally, Rebuild California, SEIU 721. Bookmark the permalink.